Give your bedroom a modern flair with the Intelligent Design Kaylee Comforter and Sheet Set. The blush comforter and shams showcases a metallic scallop print on the top of the bed, for striking contemporary look. A solid blush reverse matches the face of the comforter, while a decorative pillow adds a charming touch. Also included is a complete sheet set that complements the rest of the bedding set. Machine washable, this comforter and sheet set is made from ultra-soft microfiber to provide exceptional comfort for a restful night's sleep. This "bed in a bag" set is adorable! And the price was great, too. It conveniently includes the entire set (sheet, pillow case, sham, decorative pillow, and comforter) My daughter loves it. I got the teal mermaid scale set! 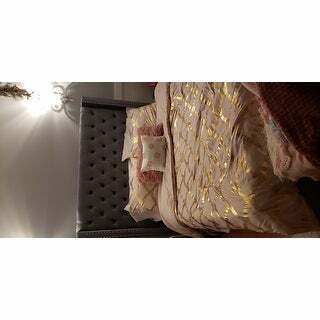 Beautiful shiny scales comfortable comforter. It came with a sheet set and decorative pillow. The sheets look so pretty, my 7 year old loved it for Christmas. Sheets are VERY soft, easy to wash, and looks great with throw pillow. Shipping was quick, fits a deep twin mattress nicely. Adorable set. We actually got this set in both pink and blue one for each of my daughters. They look great against the fabric headboards of my daughters beds. The comforters are super comfy and the accent pillows are adorable. This is a beautiful comforter and sheet set at a fantastic price! 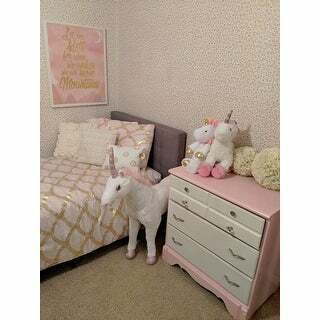 The set brings a touch of glamour to the room and my daughter absolutely loves it. This product is beautiful. It came with a decorative pillow and 4 pillow shams. Great quality and colors. This is a true light pink color. This bedspread is gorgeous!!! I bought the blush color for one of my daughters and the aqua for my other daughter and let me tell you they looove them!!! Seriously they look super expensive! All of their friends just squeal with excitement when they see their rooms!! Definitely exceeded my expectations!! Beautiful and exactly as pictured!! MY GIRLS ABSOLUTELY LOVES THEIR COMFORTERS. They are pretty and comfy and looks great on their beds! The only thing wrong with it was there was no bed skirt as advertised on the site/marked on the bag but other than that they are perfect! I ordered this for a spare bedroom and i love it. I think it is really pretty and goes with the theme I've for the room. Beautiful set! I love how delicate it looks in person. Super soft and great for the cost. My 10 great old daughter loves it. I love this product.It shines. I love the color. My bedroom is beautiful. Not happy with the quality of the comforter set, I can't return it because there is a charge to ship it back, so I guess I'll have to keep it and donate it. Cute and dainty for my college freshman's dorm room.